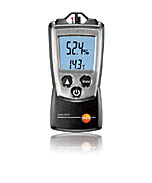 Testo 610 measures relative air moisture and temperature simultaneously. Dew point calculation and wet bulb as well as Hold function and max./min. display are possible with this instrument.